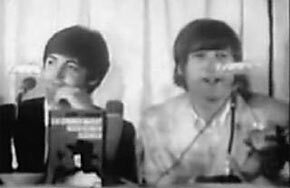 ABOUT THIS INTERVIEW: On June 23rd 1966, the Beatles flew from London Airport to Munich for a three-city tour of West Germany. 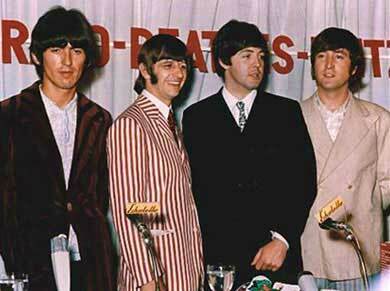 For promotional purposes, the German leg of their 1966 tour would be called 'Bravo-Beatles-Blitztournee.' The opening acts on this tour of Munich, Essen and Hamburg included The Rattles, Peter and Gordon, and Cliff And The Rebel Rousers. 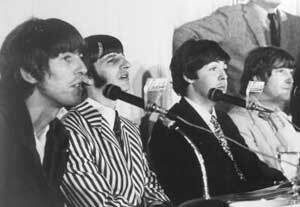 The Beatles and their entourage arrived in Munich at noon on the 23rd, holding a press conference upon their arrival at the Hotel Bayerischer Hof, and granting the following interview which was filmed for television. As part of their arrival, each of the Beatles were given elaborately crafted lederhosen, the traditional leather German shorts which remain popular in the region and are culturally associated with masculinity. 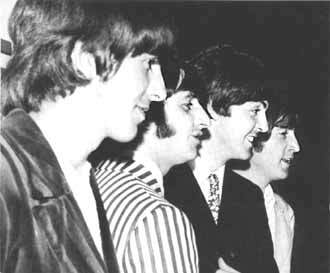 The next day on the 24th, the Beatles would give two performances in Munich at Circus-Krone-Bau. On the 25th the group would travel by train for two shows in Essen, and then finally onward to Hamburg for two more performances on the 26th. Each show in each of the three cities for the Bravo-Beatles-Blitztournee was sold out. Q: "What do you think about Munich?" JOHN: "Well, what I've seen looks lovely, and the weather's nice too." Q: "What do you think about your book here?" JOHN: "Oh, I don't know what I think about it in German yet, 'cuz I can't understand it. But the publisher's nice. In English, it's nice. I don't know what it's like, you know. Just read it and find out." Q: "What are you going to do with your lederhosen?" PAUL: "Umm, I don't know. Probably hang 'em up eventually." Q: "You're not going to wear them?" PAUL: "I might do, yeah. It's too hot at the moment." RINGO: "Terrible. I don't speak it." Q: "You don't speak it at all?" 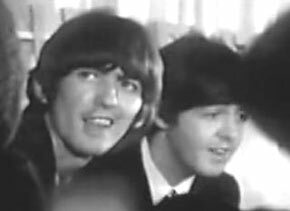 RINGO: "Not to speak of, you know. Just a couple of jokes, like spiegeleye and pomfritz, you know. (laughs) But that's not really German. That's about all I know... and wie gehts, which is enough. (jokingly) As long as you can say wie gehts, you're alright." Q: "If you could purchase a page in the Olympic Games in '72 in Munich, what would you like to be?" GEORGE: "Oh, I don't know." RINGO: "Egg and spoon race." GEORGE: (laughs) "The three-legged race, to headline the Olympic Games. Well... maybe the high jump." RINGO: "The high jump. Good one."